Barry Stein bronze frog sculpture All Stacked Up. Limited Edition of 300 and 7" high. 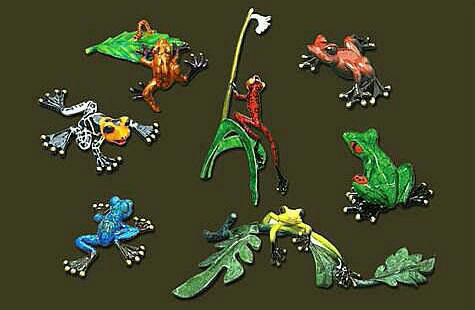 Four brightly colored & exquisitely detailed bronze frog sculptures sitting atop each other. Artist signed and numbered, comes in an embroidered soft velvet bag. Quillan Signed Ltd. Ed. of 195. "Art Gecko" bronze wall hanging in choice of 2 colors Approximately 5.5 x 3.5 x 1 inches. AP available, limited to 20 pieces each. Hand applied patina for a glossy finish. Quillan bronze frog, " Banana Splits ". Signed limited edition of 500 with 50 artist proofs available. Yellow/brown frog with long legs spread wide. Approximately 7.5 x 4 with a nice hand applied patina. Barry Stein bronze frog sculpture Card Holder in Turquoise and Burgundy. Limited Edition of 350. Exquisite fine detail and colorful patinas, signed and numbered, with a Certificate of Authenticity. Size:10.50" high. Base: 7.0" dia. 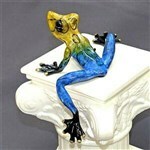 Barry Stein's brightly colored and exquisitely detailed bronze frog sculpture Chica, finished in a lustrous Blue Patina. Color mimics frog's natural colors in the tropical rain forest. Signed and numbered. Size: 5" wide. Barry Stein's brightly colored and exquisitely detailed bronze frog sculpture Chica, Yellow Head Purple. 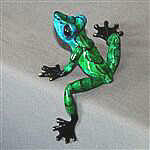 Finished with a patina that mimics the frog's real colors in the rain forest. Signed & numbered. Size: 5"w.
Quillan Signed Ltd. Ed. of 500 bronze frog "Cliff Hanger ". Large frog looking over edge. 18 x 6 x 4 w/hand applied patina for lustrous finish. Artist proof available limited to 50 individual pieces. Quillan bronze frog, " Cricket ". Signed Limited Edition of 1500, artist proof available. Small frog in a variety of colors. Approx. 2 x 1.5 inches w/hand applied patina for a lustrous finish. Made in the USA. Quillan bronze frog, " Daisy ". Signed limited edition of 700, artist proof available. 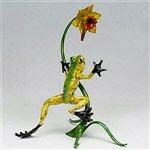 Cute red frog with yellow daisy in hand. Approx. 3 x 4.5 with hand applied patina for a rich lustrous finish. SPI Gallery, Dancing Frog Spitter sculpture in brass. Cute frog for any garden. Approximately 23"h x 19.5"w x 9"d and about 10 lbs. Meticulously hand finished using the hot patina technique. Barry Stein bronze sculpture Delilah in Gold. Limited Edition of 1000 and approximately 5" l x 5"w. Glossy patina with black patches and big bulging eyes. Artist signed and numbered, very popular, highly collectible. Barry Stein bronze sculpture Delilah, Red & Yellow. Limited Edition of 1000 and approx. 5" l x 5"w. Glossy patina with black patches and big bulging eyes. Artist signed and numbered, very popular, highly collectible. 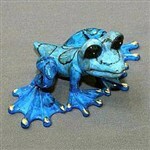 Artist Barry Stein's bronze frog sculpture Dezerae Blue Topaz. Shiny colored Patinas with webbed feet, vestigial tail and gold toe nails. Big bulging eyes adds certain kind of cuteness. Size:5"w, Limited Edition 1000. Barry Stein's bronze frog sculpture Dezerae Green. Shiny Colored Patinas with eye catching black webbed feet and gold toe nails. Big bulging eyes adds a certain cuteness. Size:5"w, Limited Edition 1000. Joseph Quillan bronze frog sculpture Dimples. Small frog with high gloss patina atop a golf ball. Approximately 2.5 x 2 x 1.75 . Edition size: 300 signed and numbered. Artist proof limited to 30 pieces. 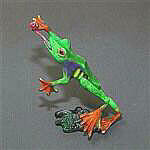 Barry Stein frog Elexess, blue head green. Ltd. Ed. of 1000. Hangs over pedestal, left leg extended, gazing out into the sky. Exquisite detail, colorful patinas, signed & numbered. Size: 6" wide x 7" long x 3"high. 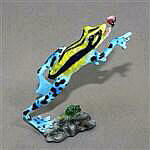 Barry Stein frog Elexess, yellow head blue. Ltd. Ed. of 1000. Hangs over pedestal, left leg extended, gazing out into the sky. Exquisite detail, colorful patinas, signed & numbered. Size: 6" wide x 7" long x 3"high. SPI Gallery, Farmer Frog Planter Holder sculpture in rust free aluminum. Approximately 25.5"h x 25"w x 9"d and 12 lbs. Add sculpture to your outdoor garden with live plant holder. Adds a touch of class! Quillan signed Ltd. Ed. of 100 bronze frogs " Follow Your Heart ". Large purple frog approaching Calla Lily. 14.25 x 6.25 x 6 with hand applied patina for lustrous finish. 10 artist proofs available. Joseph Quillan bronze frog sculpture Fore! Play. 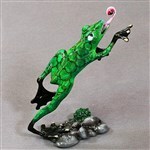 Small frog in high gloss patina with raised hand atop a golf ball. Approximately 3.25 x 2.25 x 2 . Edition size: 300 signed and numbered . Artist proof limited to 30 pieces. 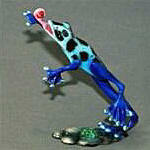 Quillan bronze frog "Forest Jump". Signed Ltd. Ed. of 250 with 25 artist proofs available. Green frog jumping from leaf. Approx. 6.75 x 7.25 inches with hand applied patina for a true-to-life finish. Kitty Cantrell Frog Buddah bronze sculpture. Life size limited edition of 50 with 1 artist proof available. Frog sitting upright w/green patina and big bulgy eyes. 13.5 long x 6.5 high and 10 lbs. Signed by artist. Quillan frog, " Froglet ". Signed Ltd. Ed. of 750 with 75 artist proofs available. Green and gold frog with polliwog tail. Approx. 6 x 2.5 inches with a hand applied patina for a rich finish. American Made. Quillan bronze frog, " Gimme 4 ". Signed limited edition of 500 with 50 artist proofs available. Green frog with right hand raised high. Approximately 8.25 x 4.5 x 3.5 with a nice hand applied rich patina. Barry Stein bronze frog sculpture Golfer in Candy Red. Limited Edition of 350. Exquisite detail, colorful patinas, signed and numbered with a Certificate of Authenticity. Highly polished granite base & approx. 11" high. Barry Stein bronze frog sculpture Golfer in Lemon Lime. Limited Edition of 350. Exquisite detail, colorful patinas, signed and numbered with a Certificate of Authenticity. Highly polished granite base & approx. 11" high. Barry Stein bronze frog sculpture Golfer Orangehead Black. Limited Edition of 350. Exquisite detail and colorful patinas, signed and numbered comes with Certificate of Authenticity. Granite base11" h.
Barry Stein bronze frog sculpture Golfer in Turquoise. Limited Edition of 350. Exquisite detail, colorful patinas, signed and numbered with a Certificate of Authenticity. Granite base, approximately 11" h.
Barry Stein's exquisitely detailed bronze frog sculpture Gotcha! in Blue. Cute colorful frog leaping to catch a ladybug. Artist signed and numbered with a certificate of authenticity. Comes in velvet bag. Size:9.0' l.
Barry Stein's bronze frog sculpture Gotcha! Blue Yellow. Cute colorful frog leaping to catch a ladybug. Artist signed and numbered with a certificate of authenticity. Comes in velvet embroidered bag. Size:9" long. Barry Stein bronze frog sculpture Hang in There!. Limited Edition of 300 and approx. 20" long x 10"high. Hanging on a green branch, this Purple frog looks stunning. Highly collectible. Barry Stein bronze frog sculpture Hang in There!. Limited Edition of 300 and approx. 20" long x 10"high. Hanging on a green branch, this Candy Red frog looks stunning. Highly collectible. Joseph Quillan bronze frog sculpture Hey Good Lookin'. Colorful frog with worm and daffodil. Approximately 8.5 x 6 x 9.5 . Edition size: 295 signed and numbered . Artist proof limited to 30 pieces.